Touting it as “good news”, last Thursday FCC Chairman Ajit Pai announced that at the scheduled July 12, 2018 Federal Communication Commission’s meeting he intends to put up for a vote a proposal to “make more use” of what is commonly referred to as C-band spectrum, seemingly inferring his willingness to free up some or all of the middle band spectrum (3.7-4.2 GHz) for the wireless industry. This, in spite of the fact that the FCC will not have a complete picture regarding the number of C-band receive earth stations in the US until July 18 – 7 days after the proposed vote now on the docket for July 12. Industry experts believe there are anywhere from 25 to 30,000 C-band earth stations in the US and that most, if not all, would be adversely affected by a proposed “sharing” of these frequencies with broadband. The proposed 5G broadband encroachment into the C-band spectrum – and the FCC’s less-than-encouraging announcement last week – has left many of us in the broadcast community even more discouraged and disheartened about the future of radio and television in the US. FCC Chairman Ajit Pai spoke to the Wireless Infrastructure Association Connectivity Expo late last week in Charlotte, NC. Chairman Pai specifically addressed the dual connectivity challenges of infrastructure and spectrum associated with 5G, and the current barriers broadband faces in the global race for 5G dominance. The FCC Chair stated he believed the FCC “had a roll to play” by “making it easier” to deploy 5G by removing policy barriers – current wireless infrastructure rules that he has deemed “antiquated” – so physical infrastructures for network deployment could occur. Pai also spoke openly about “freeing up” spectrum – including frequencies identified as C-band (3.7-4.2 GHz) for wireless services. It was then he announced his intent to put up a Notice for Proposed Rulemaking (NPRM). Though details regarding the proposal have not been released, given recent comments made by more than one commission member, one can assume the proposal will favor the interests of the broadband industry. If Pai’s proposal passes, then those potentially impacted have 60 days to try to sway the Commission before a final vote is called. The US being a leader in the development of 5G broadband is seen as an opportunity too profitable to pass up. According to Chairman Pai, industry experts predict 5G will have a major financial impact on the American economy, adding $500 billion in US economic growth. Who wouldn’t want to support an economic shot in the arm such as this? Yet, to deploy 5G, the broadband industry says they access to multiple spectrums, including prime mid-band frequencies currently populated by C-band. C-Band downlinks have not been required to register with the FCC for several decades. Because of this, the commission is under the false impression these frequencies are underpopulated, and that the exact number of C-band earth stations is much smaller than industry estimates of 25 to 30,000. 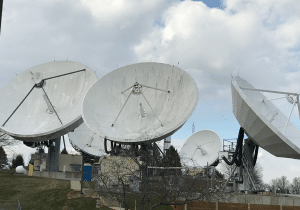 In less than two months, the registration period for C-band earth station downlinks will end, yet not before the expected Notice for Proposed Rule Making on the proposal. It’s very possible that the FCC proposal will recommend that 5G be allowed to operate with little or no limitations within the same frequency ranges as C-band in the US. The only chance we have as an industry to influence the FCC is to register each and every C-band earth station. Right now. Today. As complicated – and yes, dissuading – as the process seems to be, registering your downlinks is the ONLY WAY the FCC will definitely know that your downlink(s) exists. As of this week, the FCC officials are saying that approximately 5,000 C-band downlinks are currently registered with the government agency. If registration does not reflect reality, then the broadcast industry is – in essence – wrapping a big, red bow around C-band frequencies 3.7-4.2 GHz and handing it over to broadband. The industry as a whole will have lost any opportunity we may have had to influence the FCC because some of us were were either too busy, too indifferent, or too jaded, to register. It is imperative you continue to register your C-band downlinks. Again, you have until July 18, 2018 to do so. There is a $435 registration fee per downlink earth station. However, if you are a Non-Commercial Educational (NCE) and your FRN indicates this designation, the $435 registration fee should be waived. We’re here to help. If you need some assistance filing your registrations or you have a question about information you are asked to supply on the form, please ask us and we will try to clarify. Broadcasters should and will defend free radio and television communications. Not only it is our livelihood, but access to free entertainment has been the right of every American since KDKA became the first commercial radio station in November, 1920. If this NPRM comes out in favor of Broadband in July perhaps it’s time to awaken our audience to this issue.